An economical and easy-to-install flooring solution, laminate flooring is constructed to mimic the look of hardwood, but is easier to maintain. Known as floating wood tile in the United States and designed to simulate wood, laminate flooring is a multi-layered synthetic flooring product made from fibre board and melamine resin fused together and laminated. Laminate flooring has grown significantly in popularity, perhaps because it may be easier to install and maintain than more traditional surfaces such as hardwood flooring. It may also have the advantages of costing less and requiring less skill to install than alternative flooring materials. 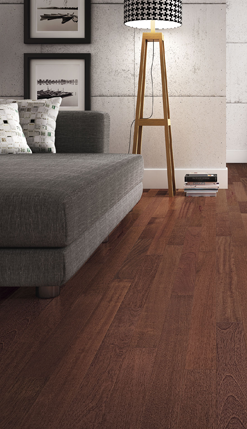 A beautiful laminate floor can set the stage for the room of your dreams. From exotic to traditional, richly detailed to sleek and smooth, laminate floors offer authentic beauty and handcrafted details that can transform a room. Don't delay - contact a Flooring Vision expert today!